Slip Hinges – Marlboro Manufacturing, Inc. The material that is used for a slip hinge is dependent on the work environment and stresses that the hinge will be under when placed in a certain application, this means that not all slip hinges are created equal and working with an experienced slip hinge manufacturer is the key to getting a proper slip hinge. As stated before slip hinges are most commonly found in applications where doors, lids and other objects must be deconstructed or removed in an efficient manner. Slip hinges are great for these type of applications as they come apart incredibly easy, yet maintain their structural integrity while in use. 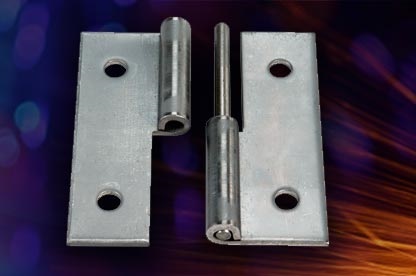 Slip hinges are often comprised of two parts, the top half of the hinge and the bottom half of the hinge, these two parts slip together to create a tight, reliable bond. For example, the bottom half of the hinge is attached to a door frame while the top half of the hinge is attached to the door, in order to secure the door in place the top half of the hinge is lowered onto the bottom half where it slips into place. This creates the tight bond that will support the weight of the door and allow the door to function, but the ability to remove the door remains a relatively simple task through the use of slip hinges. A lot of slip hinge manufacturing companies will offer custom, in-house tooling that will allow you to receive a slip hinge that is built with your application in mind, taking all of your specifications into account during the manufacturing process. This includes the material choice, the hinge angle, the height, width, thickness of the hinge, along with the overall weight of the hinge. Having a custom built slip hinge will only add to the value that the hinge will bring to your application, and the best way to get this value is by reaching out to experienced, trusted slip hinge manufacturers and seeing if they can provide a solution for your unique needs. 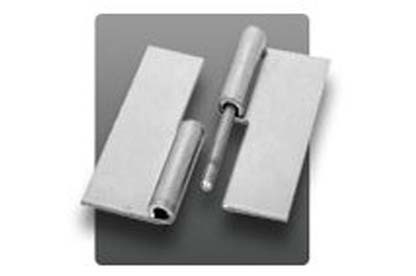 Slip Hinges Slip hinges are incredibly useful tools that are often used in applications where removable doors and lids are present. This means that slip hinges can be found across a wide range of applications and industries, and their ability to be manufactured from a number of different materials contributes to their versatility across industries.